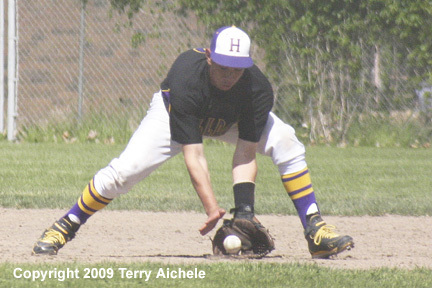 HERMISTON - The Hermiston Bulldog baseball team swept the Mountain View Cougars during senior day in a doubleheader on Saturday, May 16, 2009. Hermiston won the first game 6-1 and the second game 9-4. Mountain View led in the top of the first 1-0. 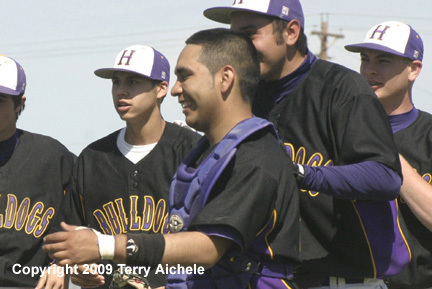 Hermiston finally scored in the bottom of the fourth when a basehit by Juan Esparza drove in a run. A walk with bases loaded forced in another run giving Hermiston the 2-1 lead at the end of the fourth. 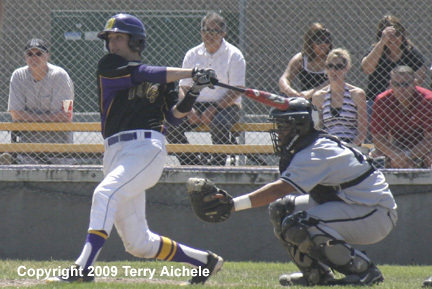 Mitch Boylen of Hermiston hit to deep centerfield in the bottom of the fifth scoring Jeremy Holden. That gave Hermiston the 3-1 lead. Next up a hit to deep centerfield by Hawkins brought Boylen around third and heading home. Boylen collided with the catcher and was ejected from the game and the score remained 3-1. Hawkins scored on a hit by Jose Rosales giving the Dawgs the 4-1 at the end of the fifth. Juan Esparza scored from third on a hit to rightfield giving Hermiston the 5-1 lead. 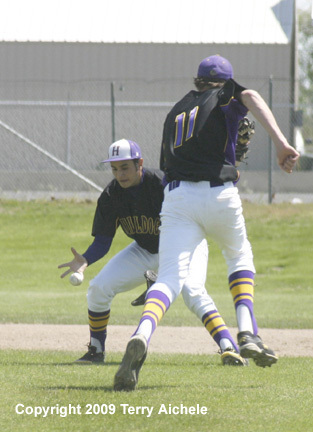 Then Tyler Green hit to leftfield scoring a runner from third and giving Hermiston the 6-1 win. Winning pitcher for the Bulldogs was Ryan Smith. Mountain View was once again the first team to score when a wild pitch allowed a runner to score from thirdbase. 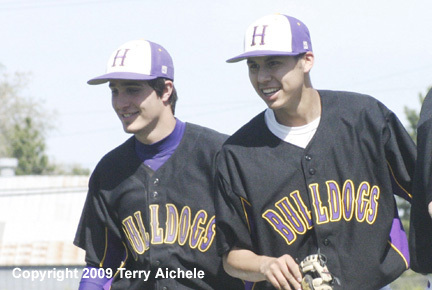 Hermiston started scoring in the bottom of the third when Hawkins hit to rightfield scoring Alfredo Moreno from thirdbase. 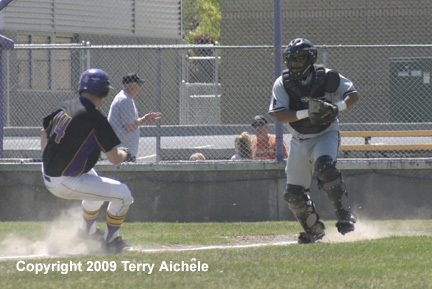 Then juan Esparza walked forcing in Holden and giving Hermiston the 2-1 lead. Tyler Green scored on a steal of home on a passball. Next Dawg pitcher Brad Irwin flew out to rightfield allowing Hawkins to score giving the Dawgs the 4-1 lead. Jose Rosales hit safely on grounder which allowed Esparza to score extending the Hermiston lead to 5-1. A Bulldog batter was hit by a pitch with bases loaded forcing in the final Bulldog of the inning giving Heriston the 6-1 lead. Hermiston pitcher Brad Irwin drove in Esparza with a triple to rightfield in the bottom of the fourth giving the Dawgs the 7-1 lead. Mountain View scored in the top of the sixth when a Cougar was hit by pitch from Irwin forcing in a run from third. Hermiston two runs in the bottom of the sixth when Green scored on an Irwin hit and Rosales drove in a run on a hit to centerfield. 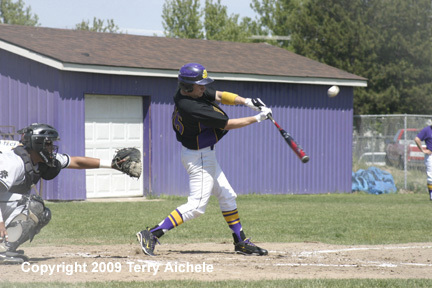 Hermiston controlled the game at that point 9-2. Mountain View came back in the top of the seventh when a hit to centerfield drove in a runner. Then a hit to leftfield drove in a run to close the Cougars to within five, 9-4. Hermiston put the brakes on the Cougars and closed out the game to take the 9-4 win on senior day. 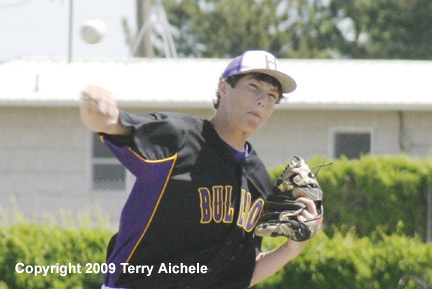 The winning pitcher for Hermiston was Brad Irwin.